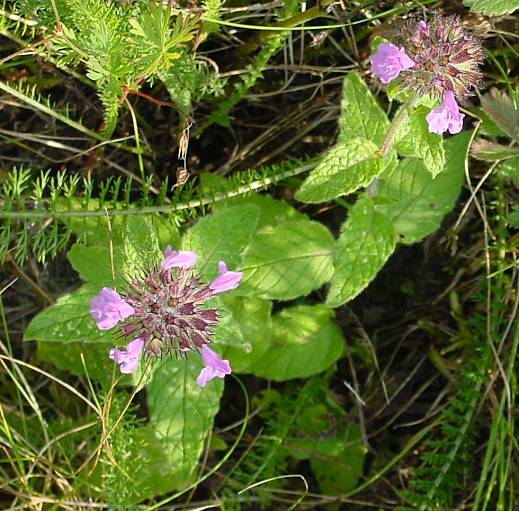 Clinopodium vulgare. Leo Michels. luirig.altervista.org (Accessed 3/2015). Clinopodium vulgare is a perennial herb, from short stolons, rooting at nodes, upper stem erect to 50 cm tall, very hairy, square. Leaves opposite, egg to lance-shaped, to 4 cm long, hairy, margin entire to slightly toothed, stalk to 1 cm upper leaves often stalkless; inflorescence head-like at ends of stems, sometimes in upper axils of large plants (resembling Monarda) each inflorescence above two leaf-like bracts, bracts directly below flowers linear, hairy-feathery, numerous. Flowers pink to purple, crowded, stalks to 0.5 cm, hairy, calyx tubular, slightly curved, very hairy, to 1 cm long, bilaterally symmetrical, 2-lipped, 5-lobed, lobes linear, veins 13, conspicuous; petal tube irregular, to 0.8 cm beyond calyx. Origin: Our densely hairy, short plants probably European origin (range also includes Nf. to Kans.). Habitat: Open areas, possibly planted in meadow restorations on fill.